Glover Teixeira, you may have retained your top contender moniker after all. One day after UFC president Dana White revealed he thought reigning light heavyweight king Jon Jones (pictured) was rightfully granted a unanimous decision win over Alexander Gustafsson at UFC 165, Jones also believes he did enough to hold off “The Mauler” on Saturday and is no longer interested in granting Gustafsson an immediate rematch. On this week’s edition of “UFC Tonight,” reporter Ariel Helwani said Jones replayed their 25-minute affair 10 times and is convinced he took rounds two, four and five. Two of the judges agreed with Jones, while one of them also gave him the third stanza. Despite having all three judges award Jones the victory, which made him the most decorated light heavyweight champion in UFC history with six straight title defenses, most fans inside Air Canada Centre pelted “Bones” with boos after the verdict was rendered because they believed Gustafsson was robbed. Apparently, White and Jones no longer want to. At least not immediately, anyway. 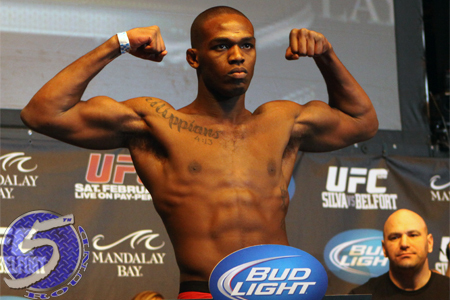 White is slated to meet with UFC co-owner Lorenzo Fertitta Wednesday to discuss what the future holds for Jones.